While most of my friends were busy as interns in hospitals around the country, I was having a great time watching films. I was down in the final semester and was supposed to appear for the Obstetrics and Gynaecology paper again after a few months. It was then that I chanced upon this story of an intern, beginning to learn the art and science of practicing Medicine under the guidance of an apparently eccentric but immensely experienced doctor. It was my first meeting with the great Akira Kurosawa. 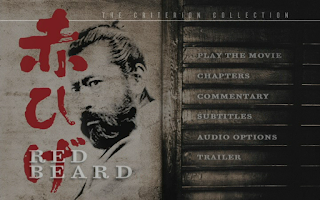 And thanks to the Criterion Collection DVD, it came with an excellent commentary that, apart from discussing the art and science of this film, talked about the life and works of Kurosawa in general. It also talked about the powerful actor who played the central character, who was soon going to become one of my favourites. 'The Seven Samurai', 'Throne of Blood', 'Yojimbo', 'High and Low' and 'Rashomon' followed. And Toshiro Mifune was going to be with me forever. It was sad to know that the great association between the two geniuses was over with, ironically, the first film I saw them in. And although I loved 'Ran' and 'Dreams' too (two of Kurosawa's later works), I missed the charismatic and versatile Mifune. The good news is, I have not yet seen all of their films. i can imagine how your experience would have been...!! I would love to share an incident about the making of Rashomon, which i came across when i was going through the autobiography of Akira Kurosawa. The forest where they were shooting, was full of leeches. so everyday before leaving for their shoot, entire team used to put salt on their bodies...and it was very difficult for them to shoot the entire film. but he completed the film against all odds and won many awards. American Academy Award for best foriegn language film was one of them. I would love to discuss Rashomon with you in order to improve my understanding about the film. for me, through Rashomon, Kurosawa has shown the diffrent perceptions made by different people.Its the game of truths and lies which we play everyday in our lives. everybody tries to reach the reality but in actuality there is no such reality. and it becomes more clear when u dont see any judges in the courtroom..all the characters are telling their stories directly to the audience. and the main incident of the story has happened in the forest, which according to me represents the confusion of human heart..as everyday we try to hide so many things within us and try to consol ourselves. but we always forget that by doing that we are lying to ourselves..!! !